Interactive books are such a hit with my kids. Who Wins? 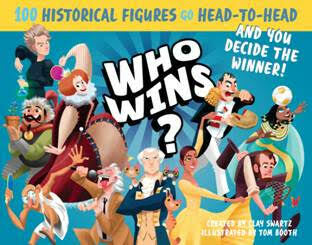 100 Historical Figures Go Head-To-Head And You Decide The Winner! by Clay Swartz and illustrated by Tom Booth is such a fun concept. You flip through the pages to match up historical figures against each other in epic battles. Mixing and matching 100 historical figures in 50 competitive categories, from Ping-Pong to climbing Mount Everest, Who Wins? turns history into a compelling game, which means kids learn while having fun in the process. Each of the famous people is given a short bio and ranked in six categories—bravery, leadership, artistry, wealth, wisdom, and fitness. And because there are no right answers, the reader decides, and in the very act of deciding and justifying the answer, real learning has taken place. I love that kids will be learning all about historical people without really knowing they are. By having to read the bios and match them up to see who wins they will be absorbing facts. Of course there is no real winner and the scenarios are just a bit of silliness - that is what makes this book so enjoyable. This is a great addition to our Summer Book Basket. Pick up your copy at your local book retailer or online at Amazon. One lucky reader will win a copy of Who Wins? Abraham Lincoln and Queen Mary of Scots! Hilary Clinton and Donald Trump would be very interesting to see for sure. Abraham Lincoln and Harriet Tubman. George Washington, and Abraham Lincoln! !